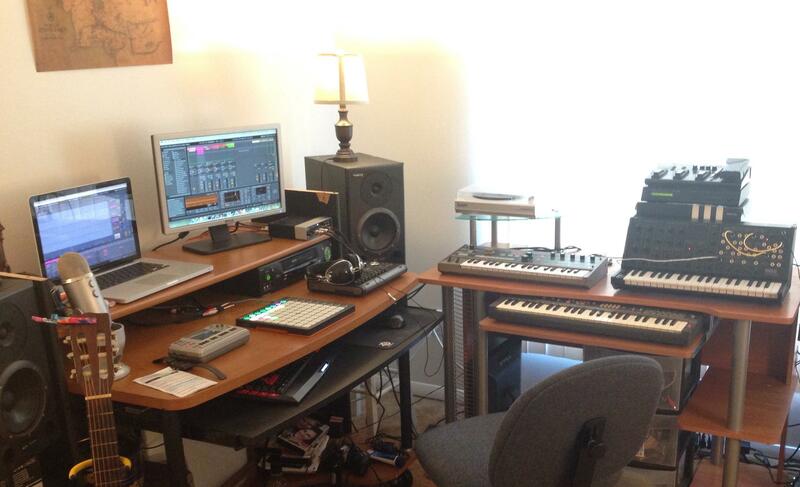 On this project I believe it is important to approach the music in the same way I approach the sound design. Both the music and sounds should be constructive towards complimenting the atmosphere of the visuals on screen, without being distracting. In the Kepler Labs prototype I have made some of the atmospheric pads bordering melodic to blur the lines between the music and the sound. Rather than songs set on top of the game they are an organic part of the environment. I rely heavily on synthesizers to compose the music and for this project I have decided to keep drums and rhythm to a minimum to keep the music from standing out too much from the sound. When there are drums or rhythmic parts I use samples close in design and texture to the sounds in the game so the rhythmic parts of the soundtrack add a sense of unease to the player as the drums click eerily back and forth in the stereo field. So that’s the thought process behind how I am writing the music for this project. Now lets look at the technical aspect of how I pull this off using two songs as examples. That Strange Odor begins with a foreboding rhythmic bass stab. This was created on the MS-20 Mini using the modulation generator as a mod source for the lowpass filter. The high pass filter was set to match the tone of the bass drone and the resonance was turned up to make that frequency stand out and add a layer of sub bass to the patch. The white noise source was routed to the pitch of the oscillator and the frequency modulation knob was used to balance the effect so that it made the oscillator noisy without sacrificing the pitch. The track continues forward as a set of voices form a ghostly choir that sweeps up and down with the bass. This sound is created by routing the audio from old VHS tapes through the external signal processor of the MS-20, a technique that can work great with any film. The tape was fed through the MS-20 then the audio signal passed through an Electro Voice BK 1632 mixer where the spring reverb was added. The audio signal was then sent from the aux out on the board to a Boss ME-25 multi-effects guitar pedal where effects such as delay and preamp saturation were added. The pedal’s audio signal was then sent back to the board where it was mixed in parallel on a separate fader channel. The overall signal from the board was then sent from the stereo sub channels out into the inputs of the UR 22 USB Audio Interface and recorded into a stereo Ableton channel. 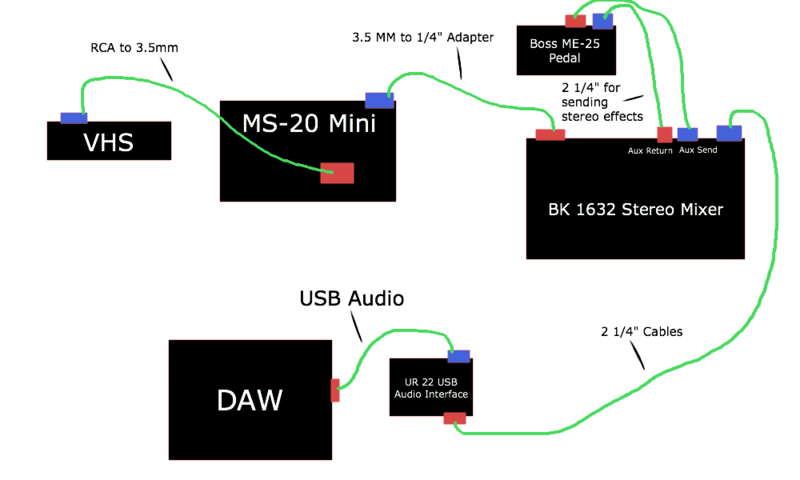 Here is a crude drawing to visualize that audio path. After recording for about thirty minutes I listened back through the recording and picked my favorite sections and looped them. This is important as the repetition is the driving force in making the song feel cohesive and organized. The ghostly loops were then side chained using the glue compressor to the rhythmic bass kicks. As the track progresses a rhythmic section made of clicks and taps begins to build. These are made up of foley recordings and processed sound effects I have used in the past loaded into the Drum Rack in the Ableton project. Mist starts out with a loud screeching noise that was sampled from the Microkorg. To make this I patched the Microkorg with lots of S&H LFO modulation on multiple parameters until I got a general feel for a sound I wanted from it. I then recorded that sound onto a cassette tape to chop and resample in Logic 9. This is what I recorded onto the tape as it was before I resampled it. The screeching drone is broken by a large booming bass kick that becomes the grounding rhythm of the track. This is where the rhythm begins to take shape with the bell pattern taking the lead. The bell pattern and other rhythmic elements were made by sending the samples through varying degrees of tremolo effects with tape delay to make the sounds bounce back and forth in the stereo field and also destabilize the pitch of the samples with the tape flutter. Near the end of each segment of the track two synth lines come into the song. These were written on both the Microkorg and the MS-20. These synth lines were recorded and processed in a very similar fashion to the diagram referenced before. That’s the approach I take for creating music for Denizen. The technical aspect evolves over time and can be entirely different from song to song but I strive to keep the core focus the same between each track. I hope you enjoy the free EP and keep coming back to see our progress on Denizen.